lives the strength of the individual soul. You will probably have recognised that we are now moving to a new location on the map of the Circle of Presence, into the widening field of complexity and interrelatedness. I have named this area of experience I and Us, as it is a logical expansion from I and Myself and I and You. It is important to realise, though, that it is only logical if we assume that ‘I’ is at the centre of things, which, of course, it is not – although it is a fairly common starting point in Western mainstream society, and consequently also how I started my journey of growing consciousness and awareness. This is the only reason why I start with ‘I’ and expand from there. Reality isn’t really like that, as we shall see as we journey further. As we saw in our exploration of I and You, a lot is happening unconsciously between us, under the surface, in our relating. It suffices to multiply all that unconscious activity by the number of participants to get a feeling of what is at play in a group of people. In addition to leaving behind our judgments of and projections on each other, opening to the inner dimension of the collective also requires us to become conscious of the deeply ingrained, common assumptions and mental models we collectively hold. Because they dwell mostly implicitly in our shared field, they stay underground and are not talked about. These shared assumptions play a powerful role in shaping our common reality and are a core component in our feelings of belonging. Nevertheless, assumptions and mental models also act as invisible boundaries that limit our capacity to see and understand. If a group can take the step of becoming aware of its limitations, a new way of thinking, acting and creating will emerge. In the domain of I and Us we will discover many dynamics at play in groups, circles and teams; even families can be examined through this lens. It goes without saying that we shall not be able to name all of these dynamics, but we will articulate some important aspects that allow circles to grow in their capacity to attain shared, collective wisdom. The capacity to hold space for each other and for the group as a whole, as explained in 3.1 is quite essential here, as is the reverse capacity: to be held by the group. What is at play in I and Us is more than being good team players. There is a subtle group field that is neither about entity nor process, neither about me nor all of the others; neither about the group’s purpose nor the process of achieving it. It is neither particle nor wave. It is all of this: a subtle, structuring field beneath the visible reality, a complex mesh comprising all our potentials, a web of invisible strands that holds a collective potential that has never yet seen the light of day. As in the previous domains, here too we will apply the four movements of inner alignment to the field of I and Us. Most of what I have described regarding the unfolding of an authentic self (I and Myself) and an authentic relationship (I and You) is well known in the sphere of training and circles concerned with personal growth. As we focus on I and Us we expand our attention to include what is happening in the group at large. This territory is known to most good trainers and facilitators, but often not consciously. As we develop towards collective, shared and rotating leadership and collective wisdom, we are all required to learn this skill and competence, not just so-called leaders. Noticing what is in the group builds on the capacity to be present to myself and in relationship with the other(s), expanding now to perceive the wider group’s field. It might start with noticing when you feel some kind of disturbance or awkwardness in the overall field. At such moments, you could offer some questions in the circle as a way of checking whether your sensing is shared or on track, and to help all participants notice what is happening: What is going on between us? What is at play at a deeper level in the group now? Noticing what is in the group is more than just sensing moments of disturbance. It is also crucial to become aware of shared assumptions and beliefs. These are invisible when we participate in a group where we feel we belong. To begin to observe them you need to step back and take some distance. This is really not easy, and very few people have been trained to do this. I first became aware of the power of shared assumptions through the work of Edgar Schein (2). When it was introduced to our little women’s group many years ago, it made a huge impression on me. Schein offers three levels at which to reflect on an organisation’s (or group’s) culture: the first level concerns observable ‘facts’, what can be measured and recognised by outsiders; the second level relates to values – the ones that insiders speak about; the third level concerns these assumptions, which are unconscious and implicit – not spoken of, but always about the essentials. I can still feel the mental stretch it took me to take it in and really start thinking about which specific assumptions we might be implicitly sharing. It is always a good idea to invite outsiders to help you in this regard, but over time, with practice, you can get a sense of the limiting beliefs and how they are at play in the group. Particularly, when all members of the group feel that there is no flow and no balance in the conversation, it can be helpful to raise some questions that inquire into these shared beliefs. It is not easy to give good examples of such shared assumptions, because they are different in every group. Suffice it to think about a total stranger from a different culture visiting your group. What beliefs would he or she have to adhere to in order to belong? What if you could offer some questions that can open this field of shared assumptions so that all participants could examine them more easily? Accepting what is in the group invites us to broaden our own personal perspective, as we now know that accepting what is is about opening the heart. Our own personal identities and intentions are now positioned in this larger field – as they have always been, but now we make the conscious effort to keep this relationship constantly in our awareness. This calls for a process of tuning in with the inner dimension of the collective we are part of. It is an inner movement of awareness – an inward, widening embrace, finding balance in a broader field of awareness. The group’s field is – of course – not visible. It exists in the subtle realms and can be perceived through our subtle senses. 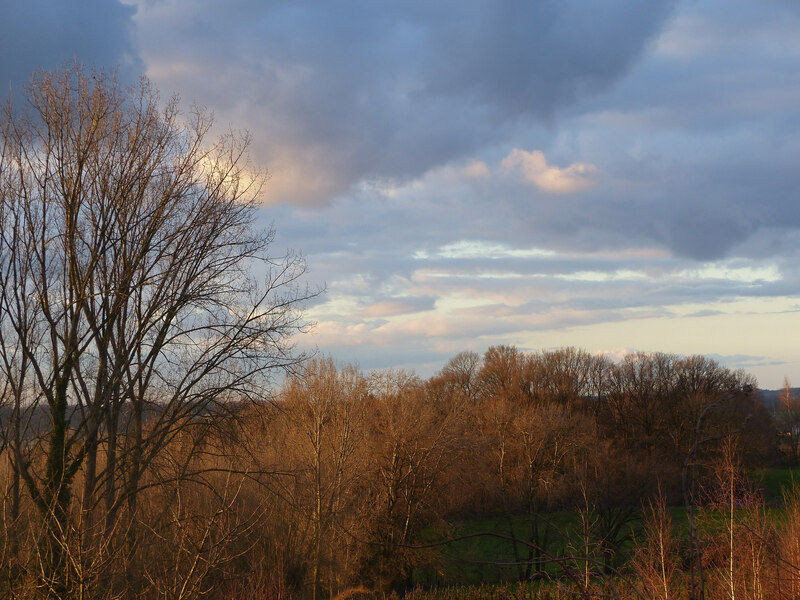 As we open our hearts and minds to this wider field we step more deeply into interconnectedness and complexity. This experience cannot be grasped by the mind only, we need another set of senses to find a point of balance in all this. Now that I am aware of this group’s field, I can understand at a deeper level why it is so important that I bring in my full potential. Once we acknowledge and open ourselves to the group’s field, we get a sense of contributing our own unique gifts, our own unique form of leadership, in service of the collective wisdom. At the same time, as we sense into the collective field, we start to see the unique contributions others are making. If there is such a thing as a group’s field, then it follows that there can be no such thing as ‘wrong’ members or participants in that field. In addition to simply observing and acknowledging this fact, comes the inner movement of accepting everyone and seeing that each individual feeds a thread into the collective weave. Sometimes participants are not aware of what they bring to the group, and the others might need to articulate what they see a person’s contribution as being. Sometimes people, used to leadership positions, have to come to terms with the fact that their role is limited – one among many – and that each individual has a role to play in service of the whole. From the experience of our women’s gatherings, I can state with confidence that that there are many more tasks, gifts, areas of work and attention than just the ‘normal’, traditional forms of leadership. Here I am thinking of the more ‘hidden’ forms of leadership: cleaning and tending the environment, bringing in beauty, providing nourishing food, initiating celebrations and rituals, organising trips, holding space and potential, send out reminders for the next gathering, making a harvest or artefact of what has happened before, and so on. All these contributions are needed, and all support the group’s outcome. Part 3.1 unpacked the concept of holding space in some detail. In a nutshell, holding space is about being aware of a potential that is present in the group but that has not yet manifested. This unmanifest potential is in you, in the other participants and in the group as a whole. Honouring what is in I and us builds on the acceptance that we all have unique gifts and more potential than we realise at first glance. If I truly honour that each person fully participates and contributes their unique gifts to the group’s field, my trust in the group as a whole deepens and I can fully relax. Now I can open to the group as the here-and-now community that takes care of me. I can trust and follow the ideas and suggestions of others in areas of life or work that are not where my strengths or preferences lie. To engage fully in the group, honouring what is in I and us also means being conscious of my own needs, big and small, voicing them and acting on them. This, too, is an act of leadership and a contribution to the whole. If you need to move your body to recenter yourself after a long conversation, just do it. Or propose it to the group as a collective exercise, because your need might be shared by others. But even if nobody else joins you, it is your responsibility to be present – not out of egotism, but in service of the group. In his interview with the Circle of Seven (3), Otto Scharmer articulates it very well: “Ken Wilber makes the distinction between I, we, and it. It strikes me that what you describe is yet another perspective: the second person plural, that is, unconditional witnessing by a collective. What I heard you describe is how unconditional witnessing by a collective works in terms of a nonjudgmental stance and in terms of the open heart. That places the attention toward what’s becoming – what’s coming into being. It’s the evolving self, not what’s already there.” Sharing our needs, expressing our vulnerability does not mean eliciting an avalanche of advice or calling for rescue. This act of sharing invites the embodied experience of being held by the group. Being witnessed in this way is enough in itself: I feel met as who I really am and I can move beyond any helplessness that might have been part of my story. The quality of attention offered in this witnessing teaches us to look at ourselves, too, without judgment. Even if we goofed, we need to feel no shame and can just take it as a learning experience. It is through the collective work in the circle that we are able to show up with ever less ego-as-habitual-pattern. Honouring what is in the group’s field is more than trusting the members of your team; this is what the above quote points to. I well remember a situation in the very first Moving the Edge gathering. Most of us were searching for what to say and do in order to reach this Magic in the Middle. Faced with so much uncertainty, most participants fell back into downloading – their default way of thinking and acting. So we heard many different proposals of what we could or should do, but none gelled to the level of actual action. None engaged the whole group. After some hours of talking, somebody got up and went over to the trolley laden with tea, coffee and Danish pastries. Everybody got up and followed, without anybody having made the suggestion, or the group having reached consensus. The break just happened. 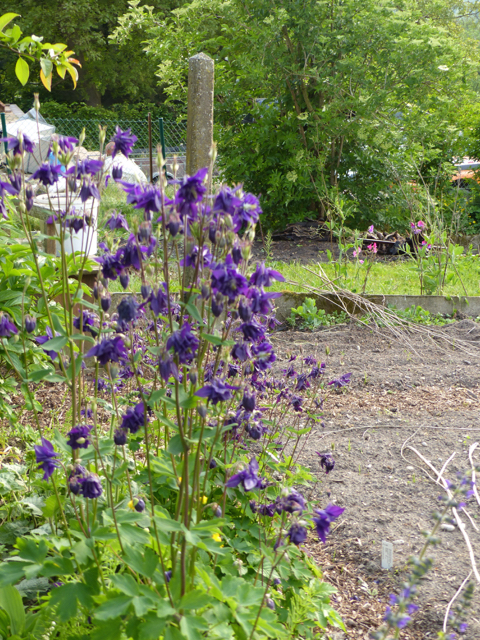 The group’s field had taken care of all of us and we listened to the emergence that unfolded and of which we were part. After some time in an ongoing circle, we begin to see clearly the special and unique flavour of this specific group. When everybody brings in his or her unique contribution, we get a splendid blend of qualities, a cornucopia of different ingredients that can lead to a totally new stew. In such groups, there is no boss, simply people who take on certain necessary roles. These are minimal and can rotate if the group so decides. Everybody participates fully, takes responsibility when needed or when his or her competencies, skills or gifts are called for. 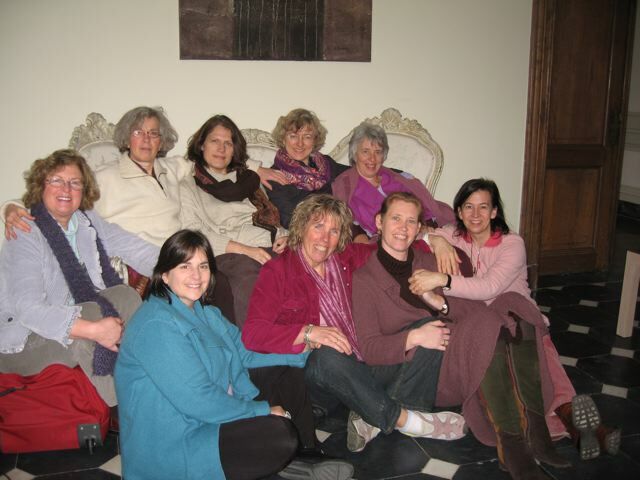 On one occasion, our Flemish women’s group was together for a four-day retreat. We were learning to rely on what was unfolding instead of planning it all ahead by the hour. On our final morning, we all got up at different times and didn’t come together until almost noon. It turned out that all of us had actually wanted to start earlier, but none of us had spoken up. We had each seen the activities of the others and interpreted them incorrectly. We had all been waiting – our habitual response of being separated – instead of making our wishes and sensing clear. That was a big lesson! If we are ever to behave as an authentic collective, each of us needs to learn to check our assumptions with the others and bring in all the available information – otherwise we are holding back, not recognising that what we, individually, have to offer might be crucial for the life of the group as a whole. Checking assumptions is often needed to restore trust and flow, when the connection and awareness of our interrelatedness has dropped out. This is a deeply systemic insight: if you hold back, the whole system is holding back. If you are not fully, consciously present, then the whole system cannot be fully, consciously present. We are all completely immersed, wanted, needed… Embodying this systemic view on life means that we are always invited to participate fully: sharing our unique gifts, contributing our subtle intelligence as well as our mental capacities. In addition to speaking, there are a multitude of ways in which a group will express its unique character. This point is worth dwelling on: in Western society we are so used to ‘the talking culture’ that we no longer recognise that it is just that: ‘a culture’ – and therefore something we can create differently if we want to. The unique culture of a group expresses itself in many different ways: how things are done, where we meet, whether we break bread together, time spent on having fun or informal talk, and so on. The different kinds of expression can be examined very intentionally and just as intentionally changed to best fit this group or organisation. Then we see the birth of an Authentic Group – the living of what is. In my little women’s group we did a lot of rituals during which we connected all the levels of our being: physical, emotional, mental, spiritual. We took the time to invent and create these rituals together and we all experienced them as extremely important. In retrospect, I can see our rituals honoured the different phases in the group’s process, although this was not planned as such. We were sensitive to how life unfolded in and as our circle, and we experimented with what we sensed was right to do at different times. This collective subtle sensing, honouring and living the life of the group is a crucial capacity for the times we are living in. 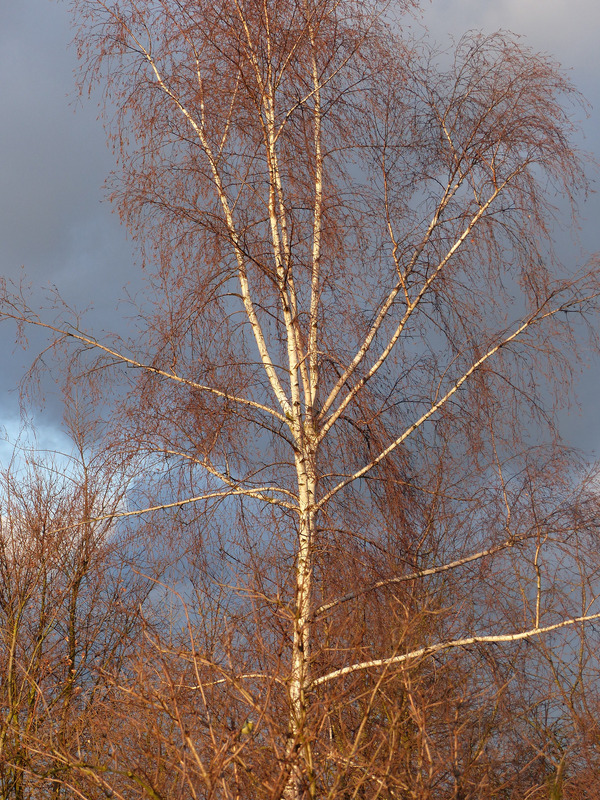 In the next chapter, we build further on this subtle sensing, but now in relation to the potential of what is present. In the movement of ever-growing awareness of complexity and interrelatedness, we will shift our focus to emergence, opening to surrender to what the subtle field of potential is showing us. (2) Schein, Edgar H. Organizational Culture and Leadership. John Wiley and Sons, 2010. And all the Earth becomes a single life. – Sri Aurobindo; Savitri. A legend and a symbol. 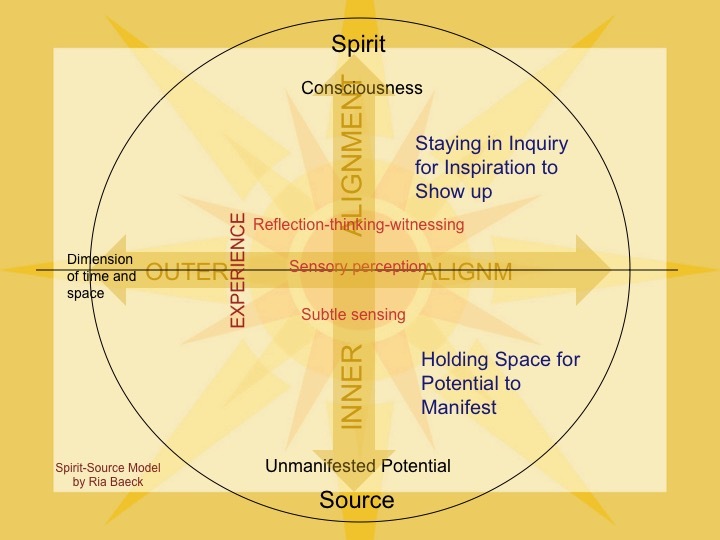 Now that my question about holding space had found a provisional answer, I embarked on a deeper quest to explore the big concepts ‘spirit’ and ‘source’. Why was it that in our women’s gathering we rarely ever talked about ‘spirit’, but spoke of ‘source’ instead? I delved deep within to uncover the core qualities and functions of both concepts as I understood them in my body and through my experience. This was no easy task, because so many concepts and ideas in our language are made to separate, while I was looking for synergy and interweaving. To get more clarity, rather than thinking and reading ‘about it’, I resorted to my more familiar tools like drawing and contemplation. On a blank sheet of paper, I wrote the words ‘Spirit’ and ‘Source’. I tend to see Spirit as somewhere high out there, while I experience Source as something deep within. So Spirit went at the top of the page and Source at the bottom. It is worth noticing my use of language here: I ‘see’ Spirit ‘out there’ and I ‘experience’ Source ‘within’. While it was possible that this distinction was valid only for me, other people were also prepared to go along with it, so I let it stand as the basis for what followed. If Spirit lives at the top of the page and Source at the bottom, then the real world is in the middle. I use ‘real’ here in the sense of space and time: the manifest world that we see and know in its three or four dimensions. 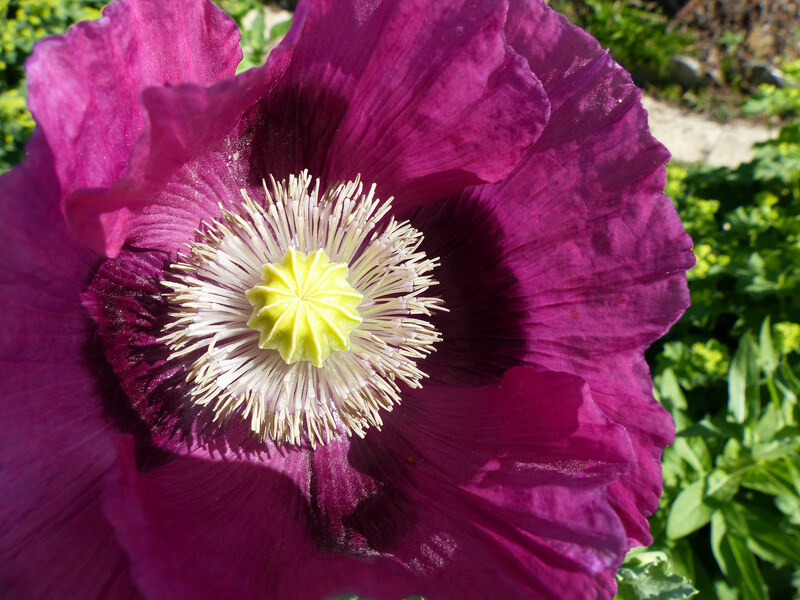 This is the world of our senses and experiences, the world of incarnation. 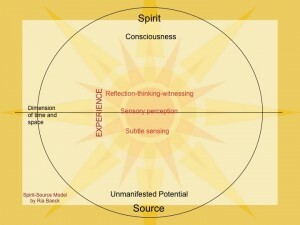 Now, how was I to understand the interaction between these three: Spirit, Source and the manifest world? My contemplation showed me the movement from the manifest world towards Spirit as a way of taking some distance from an experience, to witness, think and reflect about it; to gain more consciousness and awareness; also, the ability to capture the world and life with language, symbols and concepts. By contrast, the movement upwards from Source to the manifest world seems to originate in a huge space of potential, transiting through layers of ever denser energies, until the potential takes a form and manifests. In Gaia’s Quatum Leap (p130), Marko Pogacnik speaks of ‘source’ as life force “through which the fabric of creation is continually enlivened”. The reverse movement, sensing from the manifest world into Source, is the capacity to sense what is coming, what is possible and what has life in it. More specifically in terms of our practice here, it is sensing what is about to happen but not yet here. If we consider the latest scientific discoveries in quantum physics, my image might not remotely resemble how it works; nevertheless, it was enormously helpful to me in understanding a lot of situations. Back to holding space… In a nutshell, when holding space I connect in and through my body with the subtle energy dimensions, with the potential that is able to unfold. In my drawing, therefore, ‘holding space’ is another layer between Source and the 3-dimensional world. But, as with many failed experiments with non-authoritarian education, something is missing here if we want to see this potential actually coming into being. Holding space asks for its counterpart at the same level on the side of Spirit. Some structuring energy is required to balance the vastness and openness of holding space. That structure is provided by keeping our attention on the intention or purpose. This focus or intention must not be closed or fixed, however, or there will be no room for unfolding, emergence or birthing of the new. The best articulation I have found for this activity is ‘staying in inquiry‘. On my paper, I now draw a circle connecting Staying in Inquiry with Holding Space. It’s looking good, but I’m still not satisfied. The distance between the two outer circles feels too great. How does Source become Holding Space? 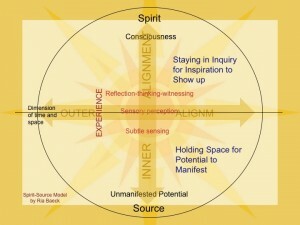 How does Spirit become Staying in Inquiry? In the movement towards the manifest world, what is Source providing? What is its first discernible level of manifestation? When I contemplate the trajectory towards manifestation from the perspective of Source, I experience a vast ocean of possibility. That makes a lot of sense: Source provides the material world with an infinite reservoir of potential. What, then, is Potential’s counterpart on the side of Spirit? How does Spirit show up in the world of manifestation? I am inclined to name that ‘Consciousness’. With this notion, I could now draw the third circle, between the first two. The resulting image struck me as highly revealing. 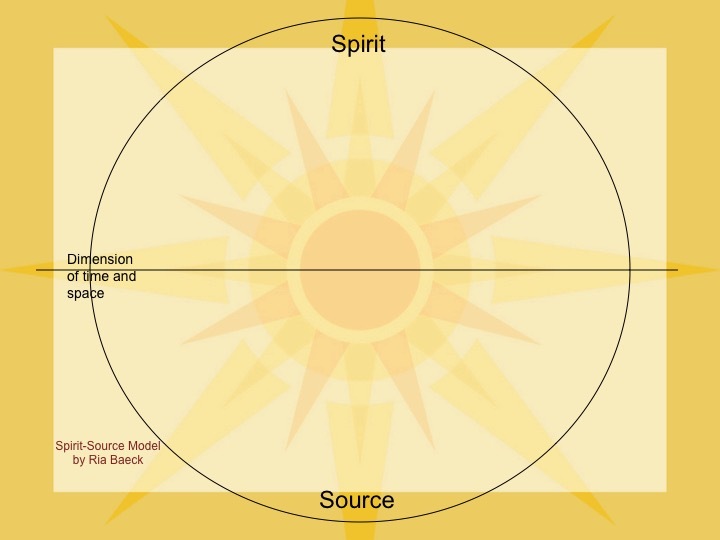 Later we started naming this the Spirit-Source model and I continued to delve deeper. Before looking into this model, I want to state explicitly that it does not aspire to be an accurate representation of reality. Wiktionary says: “’Model’ has many meanings, one of them is: A simplified representation used to explain the workings of a real world system or event.” I don’t claim to have found the truth with my model, although it continues to help me understand how emergence can come about, and what its essential elements are. You might find it helpful too. My next question was: When I am holding space for the highest potential, what is it for? What is the real purpose of holding space? Why would anyone do it? Slowly it dawned on me… Ah! I am holding the possibilities because I want them to manifest. It seems obvious in hindsight, but at the time I was thunderstruck. In essence, then, holding space provides a supporting energy or attention that bridges between Source and the real world: it is Holding Space for a Potential to Manifest. That is what parents do for their children, and it is what we do when we host conversations and change processes in groups. Equally, it should be a core competence in leadership teams dealing with complexity and uncertainty. 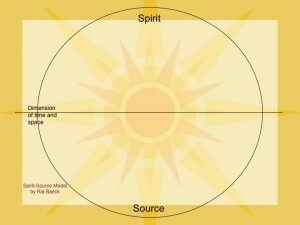 The next question to arise was: What is the counterpart on the side of Spirit? I wanted my model to be balanced; simple, beautiful and elegant like a good mathematical formula or excellent programming code. Not having any clear distinctions myself for this part of the model, I turned to a male friend for help. We concluded that the basic purpose of Staying in Inquiry is: for Inspiration to Show up. 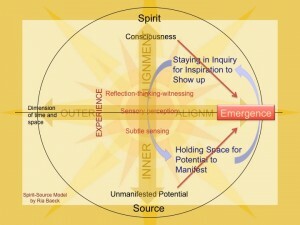 In this way I saw how Source and Spirit work together in synergy to create new life. If we hold space so that potential can manifest, and if we keep the inquiry open for inspiration or innovation to show up, then these two interweave in co-creation and emergence will happen. 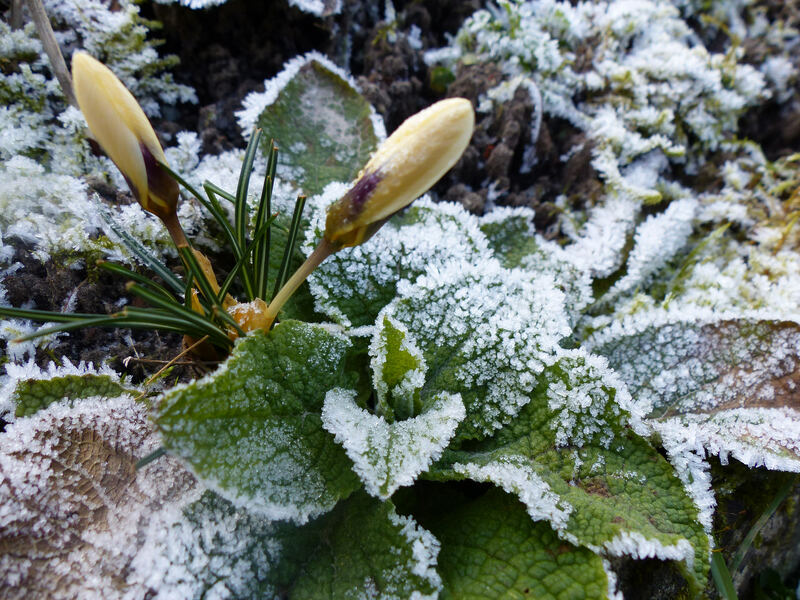 Emergence is the manifestation of something really new, the novel that never existed before. 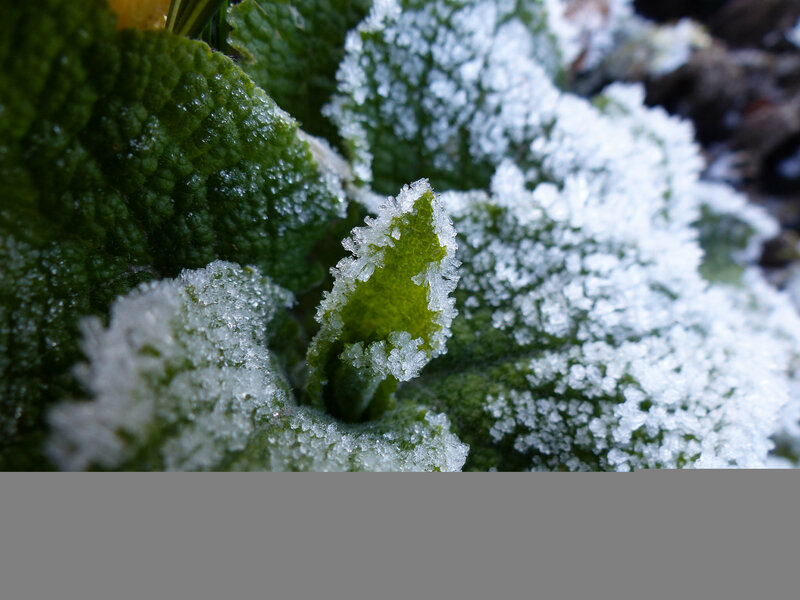 An example of emergence from science is what happens when hydrogen and oxygen atoms are combined; it makes water. The wetness of water is found in neither hydrogen nor oxygen, it emerges from the interaction of the two; it is an emergent property. The scientific concept of emergence is now finding its way into mainstream conversations, but is not always well understood. In the realm of collective intelligence and wisdom, we talk of emergence when connections have been made between different elements – like different insights from diverse participants – that lead to a totally new feature or insight. A potential that was not known or even possible before, has come into existence, and we notice an innovation in products and/or processes. In real life, even in intentionally designed group situations, emergence seems too messy and chaotic for many people to feel comfortable with – there is not enough order or control, things are too unpredictable. Although what emerges actually is some form of order, it is not any kind of pre-determined – or even pre-existing -order but something that is too complex for us to grasp in the moment it is happening. It is not until after the event that we can discern patterns that have formed and become visible. 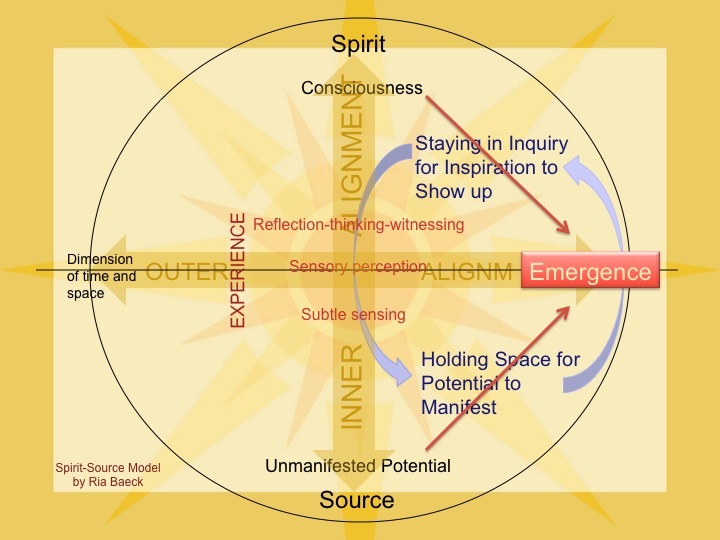 Emergence does not spring from external structures or controlled order, rather, it can be facilitated (but not guaranteed) by creating a strong energetic container (holding space for potential to manifest) while staying focused on a core question that holds an intention or purpose. This is when new and unforseen connections can arise from the chaos and emergence can come through. In some circles, this way of working is known as ‘walking the chaordic path‘. There is little that is tangible to hold on to: this holding space expresses itself only through a few guidelines or principles and is basically done in the intangible, subtle or energetic space. Chris Corrigan, a Canadian colleague from the Art of Hosting network, says: “Emergence is what happens when everyone leaves from the party with something that nobody came with.” He points to one of the conditions in a group that makes emergence possible: the interweaving and cross-pollinating that happens when people enjoy being together and engaging with each other, like at a party. What emerges is what I call ‘collective wisdom’ – a wisdom that is not the sum of constituent elements, but a weaving and bringing together of the intelligence and wisdom present in the members of the group. While this is already a welcome outcome, the emergence of generative, collective action is something more, as we shall see in the second part of this book. It requires greater alignment, more deeply into ourselves and more widely out into our context. Wisdom is a love affair with questions; knowledge is a love affair with answers. The questions are there, not to be answered, but as a guidance. – Julio Olalla, on video. There is an ongoing dynamic, coil-like, involving the level or depth of Sourcing and the level or depth/height of Consciousness (or Spirit). We can access the full depth of the potential in service of manifestation and generative action, only to the extent that we can articulate a clear and lofty intention or purpose. This explains the importance of finding powerful guiding question(s) and clearly naming the shared purpose. Just as the tallest tree has the deepest roots, the higher the consciousness from which our question is voiced, the deeper the level of sourcing it will invite and the deeper and more subtle layers of information to which it will grant access. This field that grows wider through many cycles generates authentically new wisdom. 3.1 What is holding space? The move from the I and You of the previous chapter to the I and Us dealt with in this one is easy to understand and to make. To remind us of the larger context: we are extending outward in the process of aligning, becoming increasingly aware of the complexity of life and the interrelatedness of all that is in it. In any group there are constantly multiple relationships unfolding, back and forth and in all directions, both visibly and invisibly. To realise the full potential of such a collective, and to access the collective wisdom available in the group, we need to acquire another skill: that of becoming aware of the inner dimension, the inner collective, the inner plane of a group – for lack of a better word, the group’s field. I would like to start by sharing another story, one which contributed greatly to my understanding of what might be possible in circles tended in this way. The unmanifest realm contains all that exists and all that could potentially exist. Elementary particles manifest from this place then vanish back into it. The whole of the physical world constantly vibrates in and out of the unmanifest realm. – Brian Swimme, Nature and Eros lecture (Tunitas Creek Ranch, CA: September 9, 2011). A few weeks later in a phone conversation with another friend, I told him I was holding space for him and others as they engaged in large-scale strategic, systemic work in the world – not always easy. I explained to him that this strategic work within a huge bureaucracy was not mine to do, but that nonetheless I had something to do with it: I was holding space for it. As I spoke these words, I was astonished to find tears welling up in my eyes. Articulating this inner knowing had stirred up some deep sadness. For a long time I had been holding the question: What am I really doing when I hold space? I had noticed that many facilitators and hosts nodded their heads in recognition when we spoke of holding space. They/we seemed to understand what we meant by it, but I had never heard anybody explain it, nor could I find reference to it in books. The experiences recounted here made me aware of certain aspects of it, and I realised in that moment on the phone with my friend that this capacity of holding space needed languaging: words and distinctions to make it visible in the world. 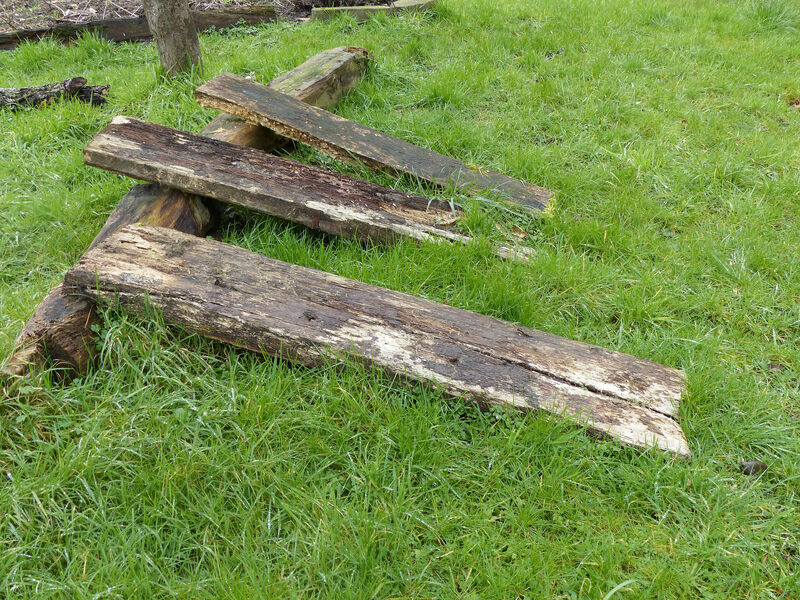 Another friend called it ‘grandmother’s work’, which was a nice metaphor but not a useful distinction. The next important experience came in a training seminar, where an awkward situation revealed to me that holding space, for me as a woman, was not something I did in the cognitive sphere of the mind, but was essentially something that I accessed in and through my body. This realisation was very grounding for me, as if I had finally landed in my right spot. From the response of other female participants at that seminar, it transpired that this was not just my unique individual experience, but something that many women resonate with. Nevertheless, the question remained, although now in a slightly different form: what am I actually doing when holding space, in and through my body? Some years earlier I had realised that I could sense what would happen next in a group process or systemic constellation, and that this was alien, weird or simply not possible for others. I also came to recognise that this sensing of what would happen next was quite different from the visions of the future experienced by others. My friend at the time was clearly years ahead in seeing what would become possible in the future, but he had no (trained) sensing organ for what might be the first next step in this unfolding, and so he was quite unable to discern where best to invest his energy, with much frustration as a result. Having been in this years-long inquiry for myself, and looking back at our experiences in the gatherings of Women Moving the Edge, it dawned on me suddenly one day that we never spoke about ‘Spirit’, but would always use the word ‘Source’. It intrigued me as to why this was. Upon reflection, I discerned that Source – at least for me – points to the depths, to something deep inside, while Spirit seems to encompass something high above, with an eagle’s view… Hmmm… I began to draw on a sheet of paper to flesh out these insights. Totally focused on my quest to understand this difference, I first apprehended that Source can be seen as ‘unmanifest matter’ – a potential that can materialise or not, depending on a host of circumstances. And so the answer to the question I had been holding for many months began to emerge. When I am holding space I connect through my body with the unmanifest potential of the person, group, place, project or gathering that is my focus. This was it! Holding space is shorthand for holding the energetic space in which the potential of people or groups or projects can unfold and enter the reality of time and space. This holding space is only possible from a state of emptiness and a deep inner stillness. Without this, the potential cannot be embraced free from attachment. Of course we do not perceive this unmanifest potential through our physical senses; rather, it is an awareness of the subtler, energetic levels. We can learn to become aware of and choose to open our subtle senses to intentionally connect with this potential in service of that what wants to or can become manifest. This intuition was later confirmed in a conversation with two dear friends about their joint project. I explained that they, as the callers or initiators of the project, would always be the ones who held the deepest and widest wellspring of possibilities. Even if they eventually expanded their core group, as they were thinking of doing, they would continue to be the callers. Other people could join and become very active in the project, and if they left the project would endure. However, if the initiators both withdrew their energy and attention, the whole project would die. In my understanding, and according to the little model that was emerging, the new collaborators were not holding the space as deeply; they were more about bringing the project alive. In further conversations, the three of us articulated that the ‘callers’ are holding the source-point of a project. (There will be more on the practice of being a caller in chapter 5). At a training seminar in the Art of Hosting Conversations that Matter, the question presented it self to me: “If a small group were to sit in silence, what influence would that have on the collective?” As it happened, and somewhat unexpectedly, many others where interested in this question. We spent what time we had together not ‘talking about it’, but practicing it directly. First there were 3 or 4 women, then 7 or 8 of us sitting in silence, with 10 minutes at the end to share our reflections and learning. I noticed at this particular seminar that people were invited to be in silence on many occasions. We were a big group, and some had to sit on cushions in an inner circle due to lack of space. I noticed that people would deliberately choose to sit near the centre in order to hold space for the rest. It seemed that a pattern was emerging and consciousness about it was growing. Holding space and place for the unfolding of what is possible looks rather passive on the outside: you are essentially doing nothing on the visible plane. And yet this holding is active; it takes a certain presence, awareness and attention. You are giving care in both the physical and the energetic dimensions. The physical attention can be seen in the careful tending to the space and in the quality of the invitation to a gathering. The energetic attention is of course subtler by nature. Still, as people enter the room they feel that there is a connectedness and a depth in the space. They notice the difference, enjoy it and are sometimes even reluctant to leave. Generally speaking, I realised, women have a natural tendency to hold space for people, places and projects. This reflects their capacity to literally hold space in their bodies for unborn babies, something they do unconditionally without knowing what this budding human being will look like or how its life will unfold. This capacity to hold a safe space in which the full potential can emerge seems to have been forgotten in the West, at least outside the domain of the family. In business, politics and organisational life, we (even those who do it naturally and automatically) are still unaware that this skill exists and is needed. Some people seem to have this innate ability to hold. It is a fine quality of moving into a vibrational resonance with what is present and what is possible. It is not exclusively women who do this intuitively, but very many do and are happy when we articulate it and give it words. I have no mainstream ‘scientific’ way to verify this, but the fact that the female body has a womb – an empty space whose function is to hold and manifest potential – could explain why so many of us do it spontaneously. Holding space is by no means always easy. In contexts of collective inquiry where there is potential conflict, where people are triggered into personal, emotional content, or caught up in giving advice or getting their point across – in short, wherever there is downloading – it can be hard to stay present to the potential. In such conditions, it can be a challenge to hold steady in that place of acceptance and support. At such times, someone needs to keep the energy and attention of the collective on both the intention of the inquiry and what can become possible through the conversations. Bringing in a question that evokes the intention and/or the potential (although without expectations) can help to shift the conversation to a more generative space. Holding space springs from a different quality of being than engaging in the conflict or debate. It can create a very different atmosphere, and at the same time it builds (on) our capacity to become present and aligned within. By tuning into and staying attentive to the intention and potential, we broadcast this frequency out from ourselves to others. In this way we invite other participants to inquire and speak from the same space, frequency or alignment. We offer each participant an opportunity to reach for their greatest potential in the here and now. Holding space is both holding the unmanifest potential and holding the tensions in the process of inquiry. Depending on your perspective, it is holding the space open for the best possible outcomes and the greatest possible participation, at the same time. It implies absolute trust in both the process and the people. Harrison Owen, the inventor of Open Space Technology, says that holding space “dates back at least to the first shamans”. The practice and skill of holding space is not limited to gatherings, training seminars and workshops, although facilitators of such events are to some extent aware of this quality they can bring in. I have learned that holding space is also used in other contexts: dance, psychotherapy, spiritual groups, and so on. The Quakers have a ‘vibes watcher’ in their meetings. Holding space also applies to mundane situations we find ourselves in every day. Wherever we are, we can be present to what is possible, in a benignly detached way without emotional engagement, expectations or fixed plans. We are just holding the potential; holding the space for wherever we are and for whatever is emerging. We know from the work of midwives and doulas that birth outcomes are improved when there is someone present during the birth process who is there to hold space for the woman giving birth, alongside the midwife, who is there for the baby. We are gradually coming to understand that this is equally true for teams and organisations. What if this quality, this tending of the energetic space, were acknowledged as important in any new endeavour? Surely it would improve the quality and outcome of any project. Later in the book, once all aspects of the Collective Presencing practice are laid out, we will build on this strategic aspect of this new human capacity. In order to avoid any confusion arising around this new concept, and in the interests of creating clear distinctions, it is important also to specify what holding space is not. I remember a story of a woman who spent many years ‘holding her sister’ through many challenging situations. All those around her could see that this kind of holding was no longer the right thing for her to do. The space she was holding for her sister did not arise from a place of stillness and centeredness; rather, she was stuck in a rut and could not respond in any other way. She was not able to say to her sister: “Do it!” or “Move on.” In her case, then, this holding space was not a capacity but a habitual pattern that she was unaware of and unable to relinquish. How sensitive is our understanding of what to hold and what not? Of when to hold and when to let go? Echoing earlier chapters: how flexible are we in our responses? Holding space is always about keeping open the possibility for potential to manifest, be it in people, in seminars, meetings and events, in teams, in companies, and so on. Sometimes the holding is more passive, like an open hand: being present, supporting, giving attention. Sometimes it is more active, giving a clear signal or impulse: now do it yourself, give it a try. Always being like an open hand is too much of one flavour, and can let a situation stagnate without realising its potential. In this case, the holding gets blocked in a kind of waiting… waiting for the thing that we hope for, but that will never happen unless someone acts. Sometimes withdrawing the holding and support and trusting in the strength and resourcefulness that is present challenges the one being held to dig deeper into their actual power that was there all along. In our Western culture, the expectation that the potential should manifest immediately blocks a natural unfolding. There is too much pressure to get things done, to take a step right now, even when it is not yet clear what the real purpose is or what action is aligned in time, space and context. Holding space needs to happen without any expectation of a specific outcome, reward or recognition; it is offering a space to unfold, and is not necessarily focused on tasks as such. Much of what good parents do is exactly this: sometimes supporting, sometimes challenging, but always open to the response and sensing what is aligned with the potential of this particular child. This capacity to hold the whole and hold space for unmanifest potential has been attracting more attention in recent years, and is starting to surface more into awareness (in the West). Because it is part of learning how to consciously and intentionally manifest, alongside actually practicing holding space, it is equally important to name and articulate this skill. It needs to be included as a foundation stone to enable every project that is set up to develop in a natural and organic way. We have noticed that once this invisible activity has been illuminated it is more easily seen and recognised by others who have never given it attention before.